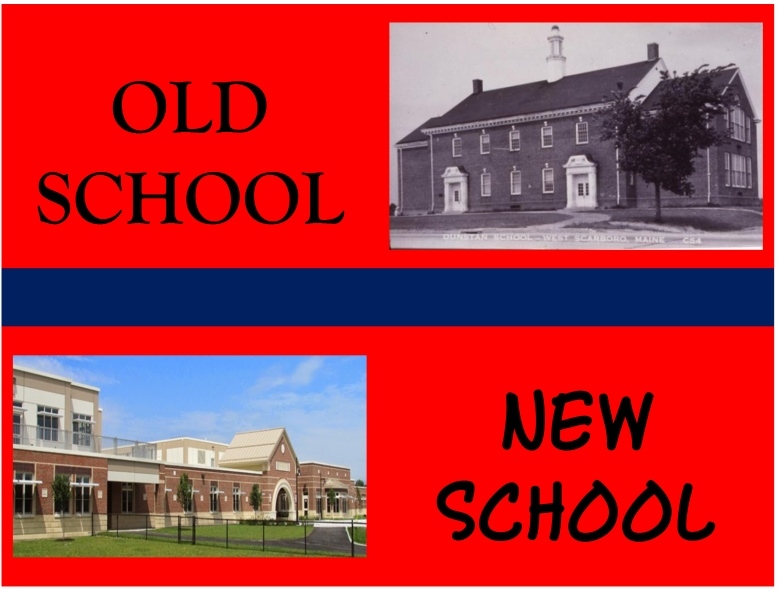 Old School/New School | Look Out Scarborough! Well, friends, June 9 will be here sooner than you think. Finally. The day we get to have our voices heard on the $39.1 million School budget. You know, the one that’s requiring 8.2% more of our tax dollars. Please make sure you vote NO and encourage friends and neighbors to do the same. The vote needs to be an overwhelming rejection of this out-of-touch budget. The members of the School Board and some members of the Town Council obviously don’t hear well… we need to be certain they hear us loud and clear on this. To avoid the last-minute crush on voting day, please consider voting TODAY. It’s easy and it literally takes two minutes at Town Hall. 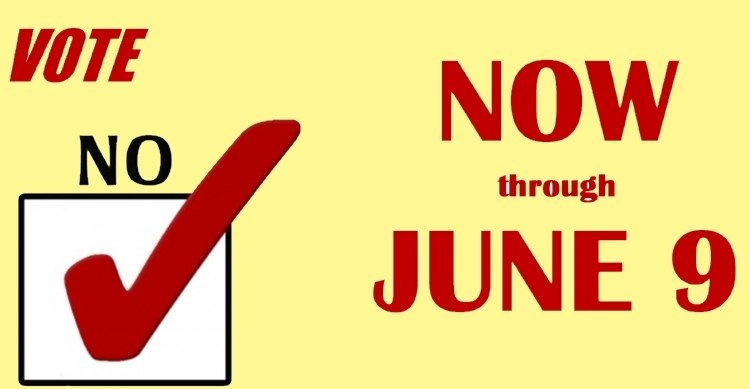 Please see the Town Clerk’s notice for the voting hours prior to June 9 at the end of this blog. Note that you can vote at Town Hall until 6:30 pm on Wednesday, June 3. 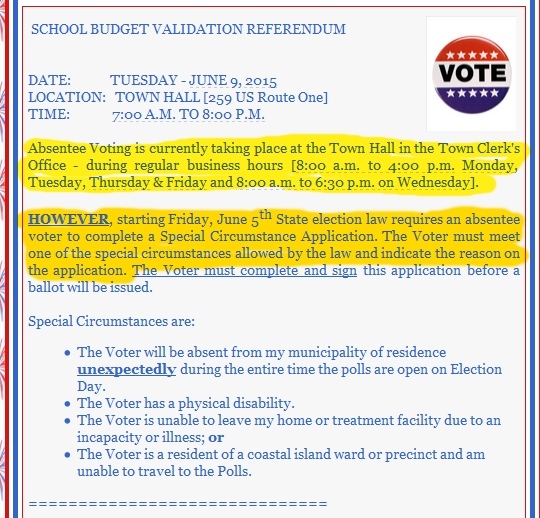 And beginning Friday, June 5, you will need a legitimate “special circumstance” in order to vote via absentee ballot at Town Hall. Andy, I can’t afford that tax bill! Scarborough is a wonderful place to live. One of the things that makes it special is the wide cross-section of people who live here. A nice mix of ages. A relatively wide variety of income levels. Folks who have lived here for their entire lives, and folks who are just passing through on personal or professional journeys. 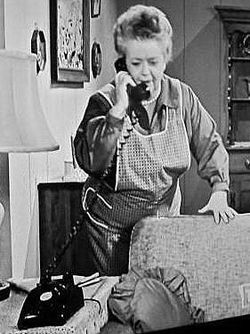 “Soc Sec COLA” is Social Security Cost-of-Living Adjustment. 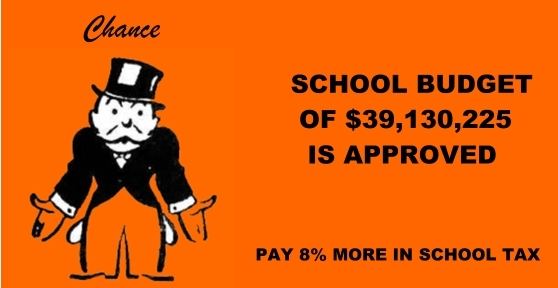 “School Budget” is the amount of taxpayer funding of the Schools. Inflation includes 1.7% increase for 2015. We all have a grand old time when everybody has a bit of consideration for everybody else. But the Town Council seems to have ignored a big chunk of the Town’s residents when it approved the 8% increase in the School budget — on top of the 28.8% increase in taxpayer funding of the Schools in the previous five years. They seem to have forgotten the 19% of the population that’s over 65 years old, many of whom rely on Social Security as a major source of income. And the 22% of households whose income is less than $35,000 per year. The real estate tax bill is one of the largest expenses for many Scarborough families – not only for those on fixed incomes, but also for those with kids. So when the School portion of that tax bill escalates at three or four times the rate of inflation, real financial pressure results. It is not just “the price of a couple of cups of coffee a week” – it’s a matter of several hundred dollars being added to a bill that’s already several thousand dollars each year. The School Board and the Town Council need to take into account the financial realities that all taxpayers face, not just the relatively affluent whose voices seem to drive Town government. Upper right: Dunstan School, circa 1965. Lower left: Wentworth School, 2015. If you were in fourth grade fifty years ago in Scarborough, you attended one of five schools – Dunstan, Oak Hill Grammar, Pleasant Hill, Eight Corners and (the then brand new) Blue Point, There were a total of 164 fourth graders among those schools. Fast-forward fifty years to 2015: all Scarborough’s fourth graders – 226 of them – attend the posh new Wentworth School. Wentworth is the home for all of the Town’s third, fourth and fifth graders – a total of 700 kids. 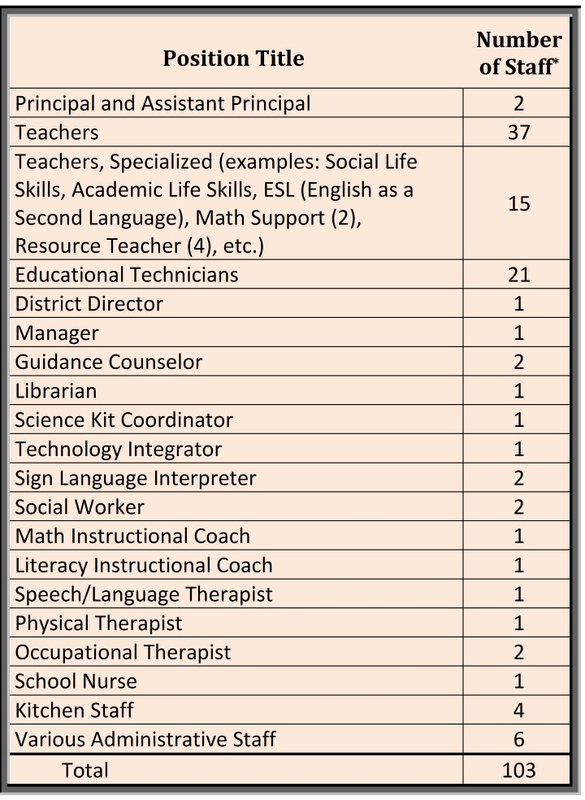 Here’s a summary of the staffing of the Wentworth School. See how many of these positions you recall having at your fourth grade school. 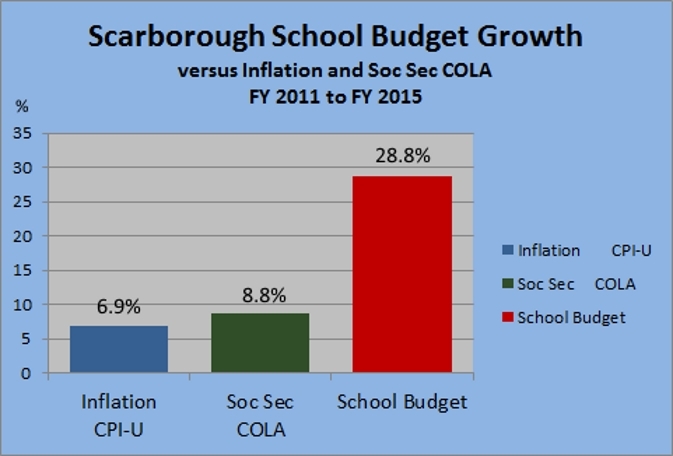 Total enrollment for all schools in Scarborough in 1965 was 1,859 and there were 97 teachers. Today there are 52 teachers just for the 700 students in the three grades at the Wentworth School. Guidance counselors for 3rd, 4th and 5th graders? Wentworth has 52 teachers and 51 support staff positions. So for every teacher, there’s another non-teacher on the payroll. Yikes. Patrick was quick to point out that people don’t fit into neat boxes, and that stereotyping is not a productive exercise. 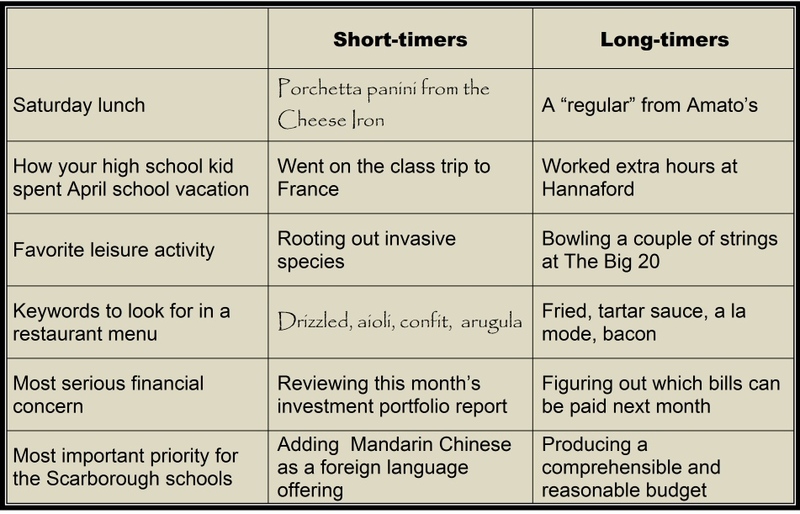 As a follow-up to the above analysis, however, he is working on a method of distinguishing Townies from other Long-timers. Here’s the scoop on voting — now and on June 9 — from the Town Clerk. If you have any questions, please contact the Town Clerk’s Office at 730-4020. They are always willing to help. 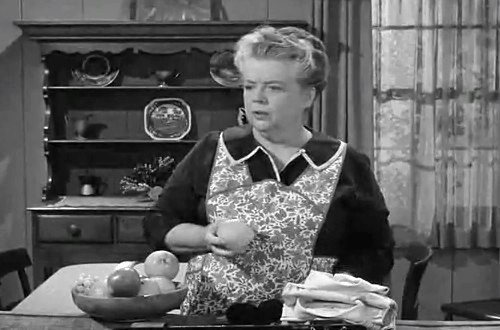 Make Scarborough affordable for Aunt Bea again… and the rest of us, too. Please vote NO on or (preferably) before June 9. Encourage friends and neighbors to do the same. This entry was posted in Uncategorized on June 3, 2015 by Site Author. “Academic life skills” are classrooms for students with significant disabilities which prevent them from being in a regular education classroom. Students with significant developmental delays, inability or limited ability to communicate their needs, limited mobility or immobility. They may be students that need toileting assistance, feeding assistance. A student with severe autism or a student with frequent seizures that has impacted their cognition need these classrooms that offer significant support…sometimes 1 to 1 or 1 to 2 staff to student ratios. These classrooms service children in this community with some of the greatest needs. I hope you, a neighbor, a friend or someone you love will ever require these services for a child, but if someone does need to access the services in the “academic life skills” classroom, thank God it is available. Thank you for clarifying this. It is very helpful to understand the full spectrum of services our schools are providing. I appreciate your taking the time to educate those of us who do not fully appreciate the role of the school in today’s world.